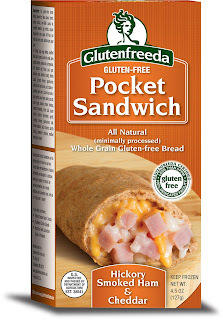 Comedian Jim Gaffigan's great routine about Hot Pockets does not apply to Glutenfreeda Foods' new Pocket Sandwiches. The company's newest innovative products, available in the Eastern U.S. beginning this month, are four all-natural microwaveable meals made with readily identifiable ingredients and don't contain preservatives, trans fats or GMOs. Though each has a different taste profile, all four sandwiches - Bacon & Eggs and Cheddar, Roast Beef with Caramelized Onions & Provolone, Hickory Smoked Ham & Cheddar and Southwest Chicken Chipotle - come wrapped in whole-grain bread dotted with flax seeds. Unlike Hot Pockets, the gluten-free sandwiches don't come with a microwave sleeve, so Glutenfreeda's versions come out more doughy than crisp. The microwave cooking directions suggest that the sandwiches heat for a minute to 1:15, but I found that they need to go closer to two minutes to get completely warmed. The sandwiches can also be prepped in a toaster oven for about half an hour; I didn't try that method but they probably come out with more of a crispy exterior that way. 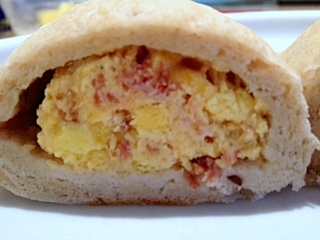 As an avowed fan of all things breakfast related, I liked the bacon, egg and cheese variety the best. My junior taste tasters and I were unanimous in putting that one and the ham and cheese at the top of the list. Our 12-year-old and 9-year-old were split on the roast beef and chicken sandwiches, with our younger one favorably likening the roast beef version to a cheesesteak of sorts, while our older son preferred the spiciness that the chipotle peppers brought to the chicken wrap. 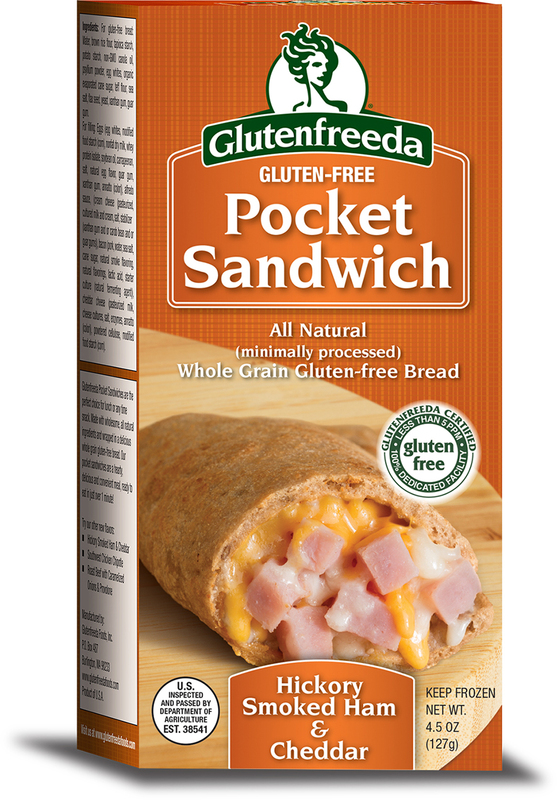 You can expect to find the Pocket Sandwiches available wherever other Glutenfreeda products are sold, like Wegmans and natural-foods markets. The suggested retail price is $3.89 each. Glutenfreeda will be sampling the sandwiches at the Gluten & Allergen Free Expo in Secaucus, New Jersey this weekend. DISCLOSURE: While Glutenfreeda Foods provided product samples for me to review at no cost, such compensation did not influence my review. Neither I am nor any immediate family member is an employee, officer, director or agent of Glutenfreeda Foods or its respective parent, subsidiary and affiliated entities, advertising and promotional agencies. Click here for my complete Disclosure.